Exactly a year ago, we were in the middle of an 11-day road trip around the South of France. It was an absolutely massive undertaking to plan, inspired by cheap flights from Madrid to Toulouse and Lonely Planet's France's Best Trips book. I pieced together many of the different road trip itineraries in the book and added in some additional stops based on blogs and sites I'd read online. The final plan was very ambitious and had us covering quite a bit of southern France, but the end result was...fabulous (if I do say so myself). Now, when I think about going anywhere in Europe on vacation, a few places come to mind, and the South of France is without a doubt at the top of that list. D - A trip like this is where Shannon's administrative strengths really shine. I would say in those moments I just sit back and marvel but most of the time I'm sort of a double jerk and not only not help, but then also take Shannon's amazing efforts for granted. Well, at least I'm giving her her due here. Better late than never! This itinerary begins and ends in Toulouse, which as mentioned previously is where we flew in and out of from Madrid. If you're coming to France from outside of Europe, you'll need to take a connecting flight to Toulouse, but you can surely take a quick and cheap flight from Paris to Toulouse or from a host of other spots - the Toulouse-Blagnac airport offers flights to 74 destinations in Europe and North Africa. We flew in late on a Thursday after work so we could have a full day in Toulouse and flew back out on a Monday evening. We got an early start in Toulouse at the Victor Hugo Market, where we ate our first French pastries of the trip for breakfast (and they were good!). Continuing on, we visited the Musée des Augustins, a former Augustinian convent that now houses a fine arts museum. 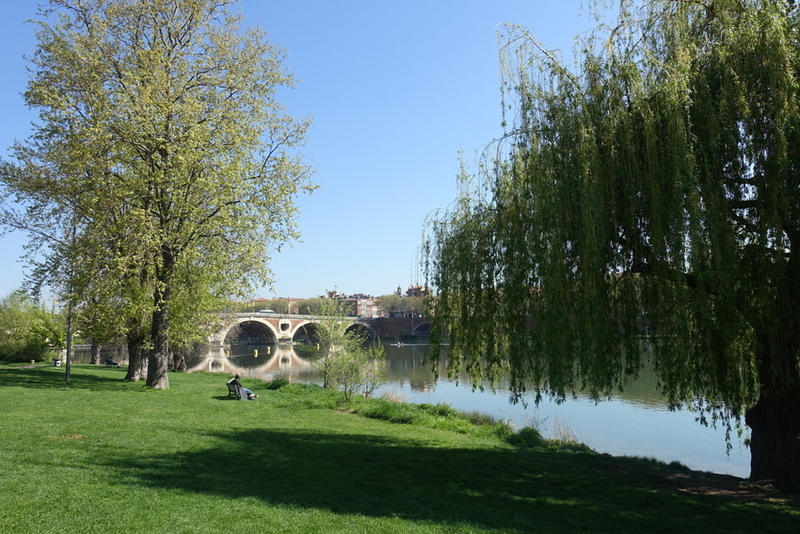 We took a walk along the river that runs through town, the Garonne, enjoying the green spaces and pathways that line portions of the riverbank. Next, we stopped through Capitole de Toulouse, the city's main square, and where the town hall is located. Many buildings in Toulouse, including the town hall, are built from pinkish terracotta bricks which has resulted in the nickname "the Pink City." Couvent des Jacobins is another church + convent combination, but this one is preserved and looks the same as it probably did when it was built in the 14th century. We ate lunch at a Lebanese place called S Com Saj with good vegetarian and vegan options before stopping into Basilica of Saint-Sernin, one of the city's two UNESCO World Heritage sites. Finally, we checked out the Jardin Japonais, or Japanese Garden, and spent a while walking along the Canal du Midi, before picking up our rental car and hitting the road. 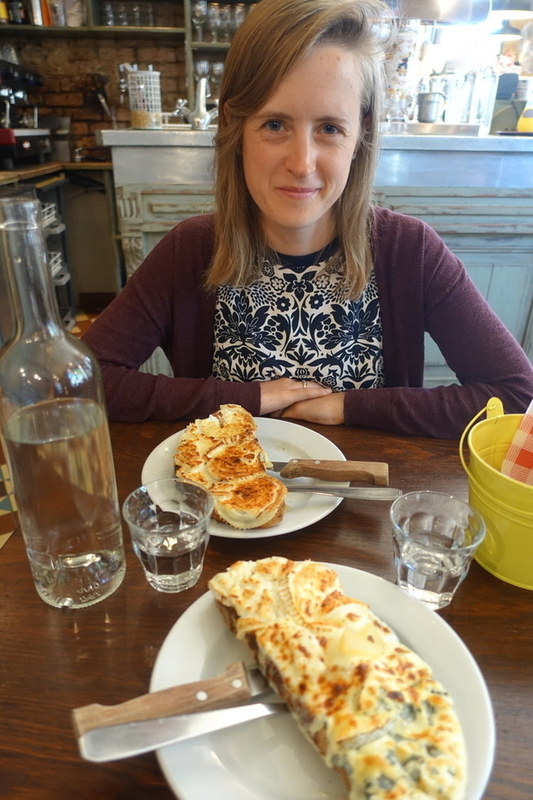 We saw a lot in Toulouse, and you might think, "I could never pack that much into a day!" or "I would never want to see so much in a day!" but it really didn't feel overly packed. 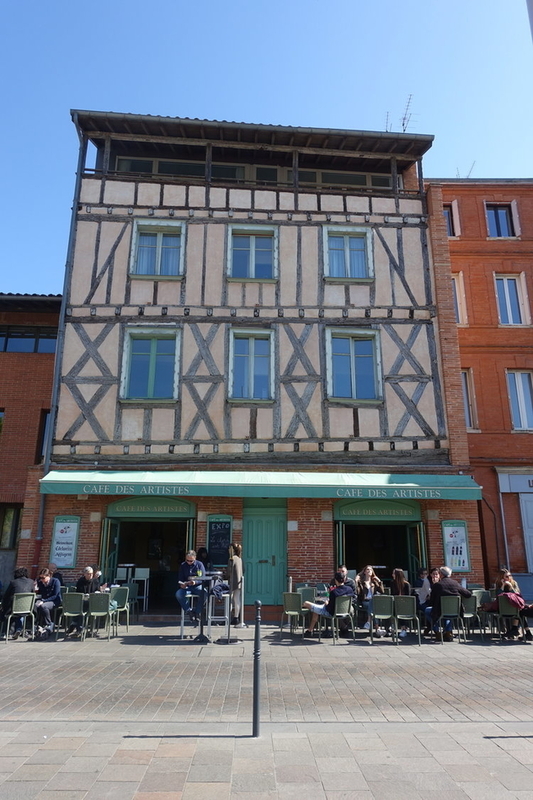 Toulouse is also incredibly walkable - we only took public transportation from the airport to our hotel and back again - and most main sights are located in the city center. From Toulouse, we drove about two hours to Cahors. We arrived a bit later than I'd originally hoped as we made a pit stop at a grocery stop on the outskirts of Toulouse to stock up on provisions. We bought food for some lunches and snacks for the next few days because we weren't really sure what we'd find in some of the small French villages we'd be visiting and staying in. D - If I'm remembering correctly, we also parked outside of a McDonald's on the way for a few minutes so we could try to use the WiFi in order to contact our Airbnb host and tell him we'd be late. Although it did end up working, I really think it's a good idea for tourists to get a local SIM card or something for their phones so they can use them while traveling. I know it would have saved us from many logistical headaches in the past (not to mention the only negative Airbnb review we've ever received, but that's a different story altogether). 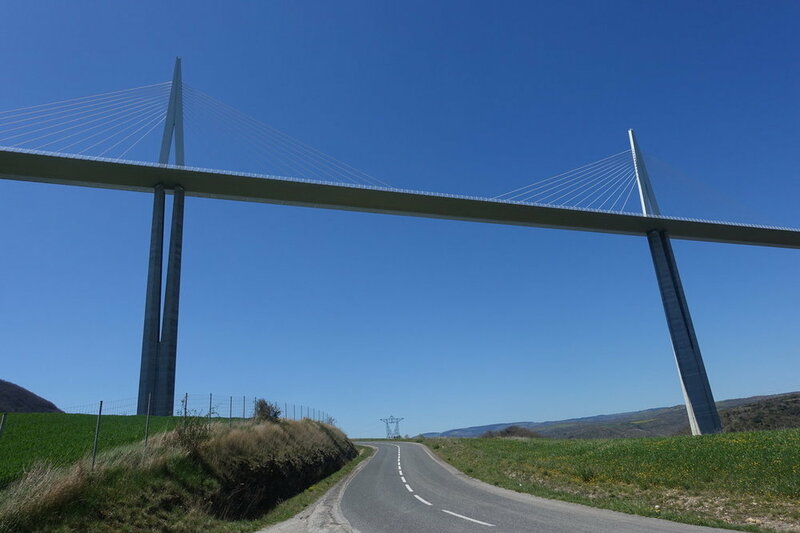 The next morning, we had to see the reason that many people stop in Cahors, the Pont Valentré. It may not make many "Most Beautiful Bridges in the World" lists, but I really think it should. It's stunning! Leave time for a walk around the old part of town, a stop at the Cathédrale Saint-Étienne, and if your timing matches up as ours did, the Saturday morning market. Our next stop was Danny's favorite French village we visited. Saint-Cirq-Lapopie is a small town (think population 200) but the church and homes perched on top of a cliff overlooking the peaceful Lot River make for an incredibly picturesque little village. A bit touristy, sure, but definitely worth a stop. D - Looking back now, I'm not sure I'd still call it my exclusive favorite, as we saw so many beautiful villages, but it would certainly be listed as one of them! We drove through Bouziès, which is even smaller than Saint-Cirq-Lapopie, a sleepy riverside hamlet, and stopped only for a picnic lunch. Rocamadour is popular with pilgrims and tourists, and since it's also located on a cliffside, is a great place to a work up a little sweat and then enjoy some ice cream in the sun...we visited during a stretch of beautiful weather in April, so that's just what we did! In the afternoon, we took a tour of Padirac Cave, the most visited cave in France. There are some incredible formations inside the cave, and it was pretty cool to take a canoe through an underground waterway, but I have to say that I was disappointed with the lack of care that we saw from the staff at Padirac - no admonitions to visitors not to touch the cave walls or make sure to watch your step and stay on the path - and to be honest, it shows. Hundreds of thousands of visitors have put a good deal of wear and tear on this incredible natural feature, and it's a shame. Our next stop ended up being my favorite village we visited. Loubressac was a treat to walk around, and although it doesn't boast the natural beauty of Danny's pick, Saint-Cirq-Lapopie, it doesn't get the tourists either. It was a short stop for us, but one I'm glad we made. We didn't have as much time as originally hoped to spend in Figeac, our final stop of the day, but the few minutes we did take to walk along the river at dusk were pretty serene. There's much more to the town than what we saw - I mean, this place even had a McDonald's! - so leave time for the medieval town center if you visit. 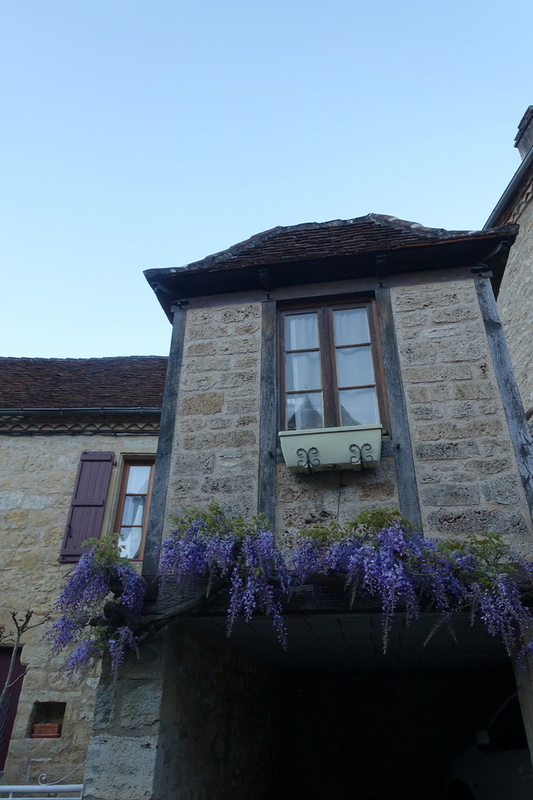 We stayed the night in Marcillac-Vallon, a small village that we picked simply because there aren't too many Airbnbs available in these tiny French towns - sometimes we had to go somewhere that wasn't previously on the itinerary just so we wouldn't have to sleep in our rental car! Our hosts in Marcillac-Vallon were fantastic and not only provided breakfast the next morning, but also a tour around the town's market. It was a really fun experience and a good example of just one of many reasons why we love Airbnb. After leaving Marcillac, we got on the road to Belcastel, a village that could be a close second for my favorite French village. When we visited, it was quiet, and as we walked along the town's main street, everywhere we looked was picture-perfect: the chateau on the hill, the 15th-century bridge leading to a similarly aged church, people picnicking in the grass under willow trees...and it was a hard act to follow when we drove to the Viaduc de Millau (the tallest bridge in the world!) and the highly-praised visitor's center was closed. The viaduc is a marvel, don't get me wrong, but after seeing buildings and bridges made of stone (and made by hand! ), it just felt a little out of place. The main attraction of day three, though, was the Gorges du Tarn. We drove through three different gorges during our road trip, and this one follows the River Tarn for about 50km and is one of the deepest gorges in Europe. While driving, we stopped in little villages and at viewpoints whenever we wanted to take a photo or explore a little more. We reached the 'point sublime' around lunchtime, where we stopped to eat and enjoy the best views of the whole drive. Sainte-Enimie was a neat surprise, and also a real standout on the trip. There seemed to not be a lot to the town, but after turning a few corners and getting away from just the first row or two of shops and restaurants on the main street, we uncovered a maze of well-preserved homes and passageways. Unfortunately we were there as the sun was setting, so we couldn't stay too long, and all of our photos from the stop are dark, but this is another town I highly recommend, especially as you leave the Gorges du Tarn. We stayed the night on our third day in Le Pont-de-Montvert, another place we wouldn't have visited had it not been for our need for somewhere to sleep at night. ;) We had just a pinch of time to explore before it got totally dark, and it was just us and the river as we took a short walk before bed - one of those times when we might've really missed out had the WiFi in our Airbnb been working! Our main highlight on day four was the stunning Gorges de l'Ardèche, but before we got there, we visited Labeaume, another little riverside village. We took a quick walk around, enjoyed some of the beautiful spring blooms, and continued on to the gorge as we wanted to be able to continue being outside before it got too hot out! The Gorges de l'Ardèche was my favorite gorge we drove through in France. 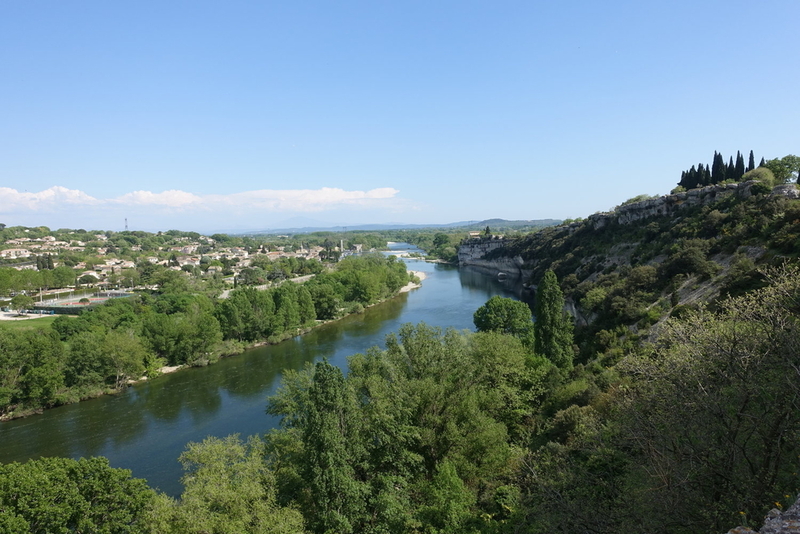 All of the pull-offs and viewpoints were well-marked and offered plenty of parking space, plus the Pont d'Arc at one end of the gorge is really a treat - Danny even braved the chilly spring waters and went for a swim! Aiguèze followed our long (but wonderful!) drive through the gorge, and while we hardly encountered another person while walking through this little town, it didn't take a place as one of our favorite stops. No particular reason, but it just didn't stick with us as being out of the ordinary and extra-special...no doubt it did offer some beautiful moments though! Orange is an important town in the south of France, and although we'd had a busy start to the day, we tried to leave enough time for all that we wanted to see in this centuries-old, Roman-founded settlement. We spent most of our time touring the impressive Roman Theatre, but also made stops at the Orange Cathedral and the Triumphal Arch before continuing to Vaison-la-Romaine, where we spent the night. Vaison-la-Romaine has Roman ruins just like Orange (and many other towns in southern France) but we opted not to tour them as it seemed like there were more remains than structures left. We were in for a treat, though, as Tuesday morning is Vaison's market day, and this was a serious market! Local, fresh produce, cheese, meats, and more, plus pastries and paella (to name a few offerings) - this is a good market to set aside a morning for if you can. I'd read about Sisteron in advance, but I have to admit, it was better than I expected - the cliff rising above the town and river (which looks aquamarine in the right light) is absolutely striking. As with so many places we visited, we were some of the only ones out and about, which was such a treat! Our next stop was Moustiers-Sainte-Marie, a town at the start of the Gorges du Verdon. There's lots of charming streets to walk here, as well as a chapel from the Middle Ages to climb up to above the town. I'm glad we took the time to enjoy Moustiers - and our daily ice cream! - but do be aware that you'll join up with tourists here as well. The drive to (one end of) the Gorges du Verdon from Moustiers-Sainte-Marie is quick, and we began our journey through our third and final French gorge of the trip. There's many different ways to see the gorge, whether by foot, kayak, raft, or car, but due to a combination of the weather and time constraints, we opted to just drive it and get out along the way for short walks. We finished the day and spent the night in Castellane, a town not far from the Gorges du Verdon, and a starting place for many rafters, hikers, bikers, and swimmers. 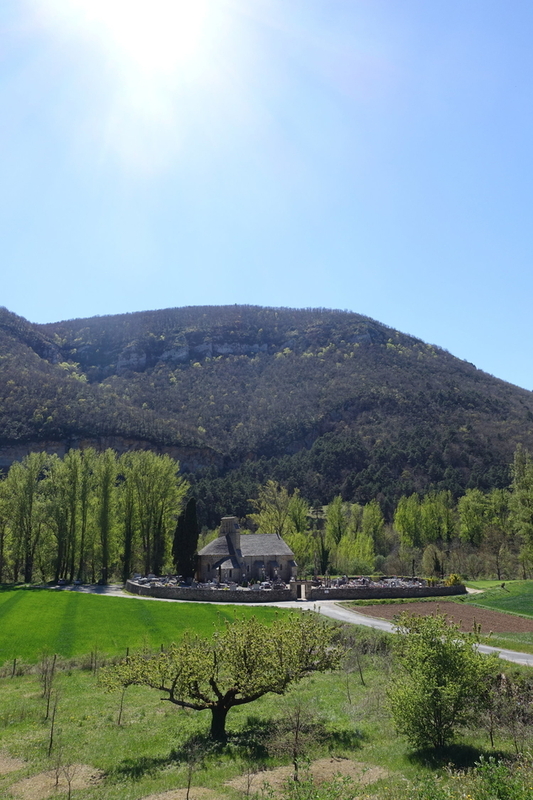 It was another packed day, so we made the most of every moment of sunlight we had remaining as we hiked up to the Chapel of Notre-Dame du Roc, a small 18th-century church that overlooks the town from a cliff of about 900m. The views of the town below and the setting sun were a treat as we wrapped up our final day in the interior of France. D - The only downside to watching the sun set on the top of cliff is the hike down in the growing darkness afterwards. This downside was further exaserbated by my near constant fear of being attacked by wolves (they live in France, I saw them in Beauty and the Beast) or a mountain lion. As we started to make our way towards the Riviera, we noticed that the crowds increased, the roads got busier, and everything felt a bit more touristy. We stopped in Grasse, known as the perfume capital of the world, to take a tour of a perfume factory. After doing some research online, we selected an English guided tour at Parfumerie Fragonard (with a low-pressure drop-off in the gift shop at the end, of course!). Saint-Paul-de-Vence is a perfectly pretty place, especially from afar - it's a walled town on a (little) hill - and one of the oldest medieval towns on the French Riviera. 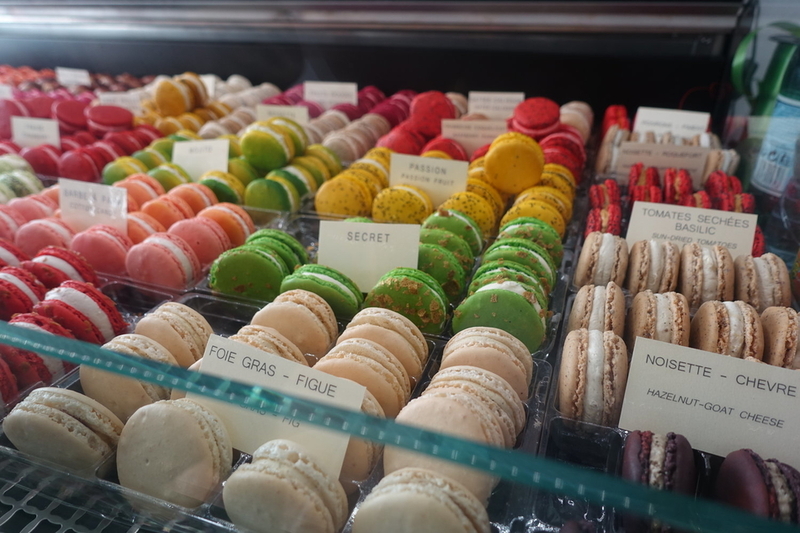 We ate lunch (and macarons!) here. We had one final stop, Antibes, before we reached our home for next three days, Nice. Antibes was the first (of many!) coastal towns we visited, and we concentrated our time around the harbor, beach, and ramparts. Port Vauban, Antibes' harbor, is actually Europe's largest yacht harbor, making it a hotspot for boats from around the world. In fact, on the day we visited, the Dilbar, currently the world's largest yacht, was docked in Antibes, which was pretty cool to get to check out. The drive from Antibes to Nice should only be 30 - 45 minutes, depending on where in the city you're trying to go, but the French Rivieria can be crowded, and for some reason, even on a weekday in mid-April, that's what we encountered - hours of traffic as we tried to reach our Airbnb in Nice. We didn't have the time to explore Nice that evening that we were hoping to, but if we'd had some of the afternoon and all evening, we would have visited St. Nicholas Russian Orthodox Cathedral, walked along the Promenade des Anglais, and had dinner and gelato in Vieux Nice (Nice's old town). With the time that we did have, we took a look at St Nicholas from outside the gates and ate dinner at La Goulette, a Tunisian restaurant we found nearby, before calling it a day. 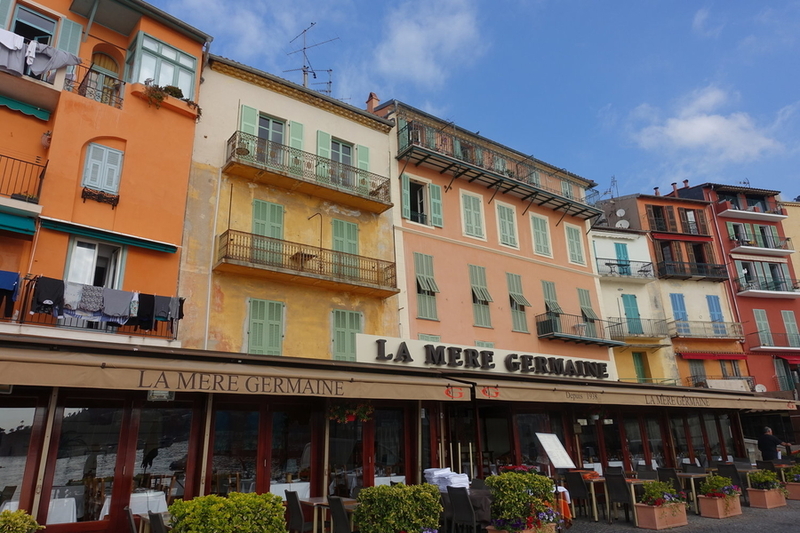 Originally, we'd planned to drive up and down the Riviera on days seven and eight, but after our experience the day before getting to Nice, we quickly rearranged our plans and kept our car parked for the next couple of days. We took a short train from the center of Nice to Monaco and spent the morning and part of the afternoon walking around, exploring the Jardin Exotique de Monaco, touring the Prince's Palace, watching the changing of the guard outside the palace, stopping in Saint Nicholas' Cathedral, and checking out Prince Rainier's Private Collection of Antique Cars. We also passed by preparations for the Grand-Prix, the principality's harbor, the famous Casino de Monte-Carlo, and ended our visit with lunch at Eqvita Restaurant, the brainchild of tennis player Novak Djokovic. After returning to Nice, we visited the interior of St. Nicholas Russian Orthodox Cathedral, a church built by the Russian royal family for vacationing Russians in the early 20th-century. Another group of foreigners, this time English expats who enjoyed vacationing in the area, built and paid for one of Nice's most famous attractions, the Promenade des Anglais in 1822. The boardwalk follows the coast for 7km, and is particularly known for its blue lounge chairs. Off the boardwalk and into the old town, we enjoyed gelato from Fenocchio before walking up Castle Hill for panoramas over the city and nearby Port Lympia. After spending a second night in Nice, we spent a day taking the train to small towns along the coast. We began in Villefranche-sur-Mer, the first town on the Riviera from Nice in the direction of Italy. Compared to some of the busy towns we'd recently been in, it felt like we had Villefranche all to ourselves - probably because we'd gotten an early start and beat all the sleeping in vacationers. Colorful homes contrasted with sharp shutters overlooking a quiet harbor - it was a peaceful start to a packed day. The round-trip ticket we bought in Nice listed our final destination (Ventimiglia, Italy) and allowed us to hop on and off the train as much as we wanted all day, which was ideal since as soon as we were finished in a town, we'd just head back to the train station and wait for the next one going in the right direction. Our next stop was Menton, the last stop for many before they cross the border into Italy. We spent our time in "the pearl of the Riviera" walking the boardwalk by the sea, climbing up to the cemetery that boasts grand graves and sweeping views, and making our way through narrow streets which felt more like pathways (many of them are pedestrianized). We also popped into a few churches, one of which, the Basilique St-Michel Archange, is southern France's grandest baroque church. Ventimiglia, Italy is as far east as we took the train, and to be honest, the main reason we did was for lunch - we ate at Pasta & Basta, and were impressed with the homemade noodles and reasonable prices. The place was hopping - I don't think we were the only French Riviera visitors with the "let's-have-lunch-in-Italy" idea - and servers were busy and bit distracted, but we were there for the food, not a leisurely meal with impressive service. The indoor food market was the only other real point of interest for us - everything else in town felt a bit more rundown and not as well kept up as French towns, so we continued our journey back into France the way we came, and on to Èze. Èze sits high up on a hill over the Mediterranean Sea, and is best reached by car or by bus, or for the cheap and hearty, by foot. The Nietzche path, which took us about an hour to walk, leads from the train station to the pedestrianized medieval village. The town is charming, no doubt, with homes and paths made of stone and beautiful views over the sea and surrounding area. 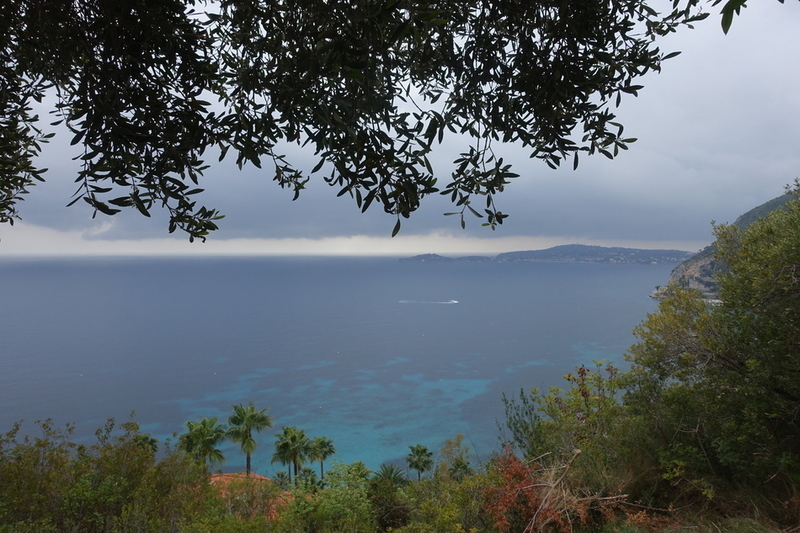 We visited Le Jardin Exotique d'Èze, the town's botanic garden, even though we'd seen Monaco's only the day before, and maybe it was all the crowds and cloudy skies in Èze, but we found that we preferred Monaco's. Leaving Nice, we bucked the advice of many and made our first stop of the day in Cannes. The seaside city might be known for its annual film festival, fancy boutiques, expensive restaurants, and fashionable hotels, but it was on our way and I was up for giving it a chance. We walked along the palm tree and blue chair lined Boulevard de la Croisette, ate at Steak 'n Shake (I know! We needed a vegetarian lunch option quickly, and other options were either closed or way out of our budget), posed at the Palais des Festivals, and made our way up to the Cannes sign via Le Suquet, the old town with cobblestone, pedestrianized streets, colorful buildings, and that familiar French village feel. D - I might argue that a trip to Steak 'n Shake is integral to truly enjoying the perfect South of France road trip. Don't get me wrong, I loved almost all of the food we ate throughout our trip, but it was very refreshing to eat something totally different than what we had been eating every day. Because we left Nice a bit later than intended and enjoyed Cannes more than anticipated, we arrived in Aix-en-Provence, our second and final stop of the day also a bit later than planned. The south of France is full of beautiful towns to visit, but Aix-en-Provence is really something special. Aix is known as the town of a thousand fountains, and it's also a university town, which may explain all the hip restaurants and shops we came across while walking around. We made stops at the Pavillon de Vendôme, a 17th-century home turned event space surrounded by formal gardens, Cathedrale Saint-Sauveur, which is free to visit and boasts a green and gold organ, multiple squares, Le Farinoman Fou for fresh bread (supposedly some of the best in the world! ), and Fresh Box for pad Thai. After walking around until it was too dark to continue, we spent the night at an Airbnb in town. The next day was Easter, but we didn't let that slow us down! 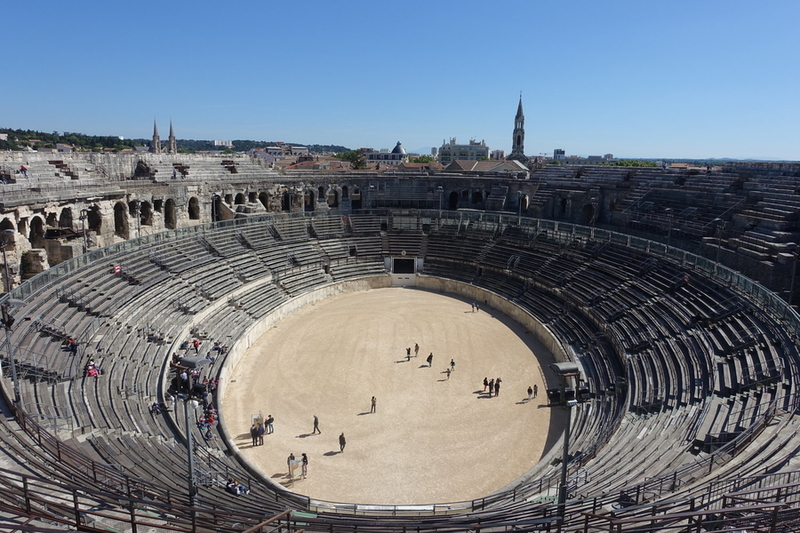 After breakfast at our Airbnb, we drove to Arles, where an annual Easter Feria takes place, which includes bullfighting in a centuries-old Roman arena. 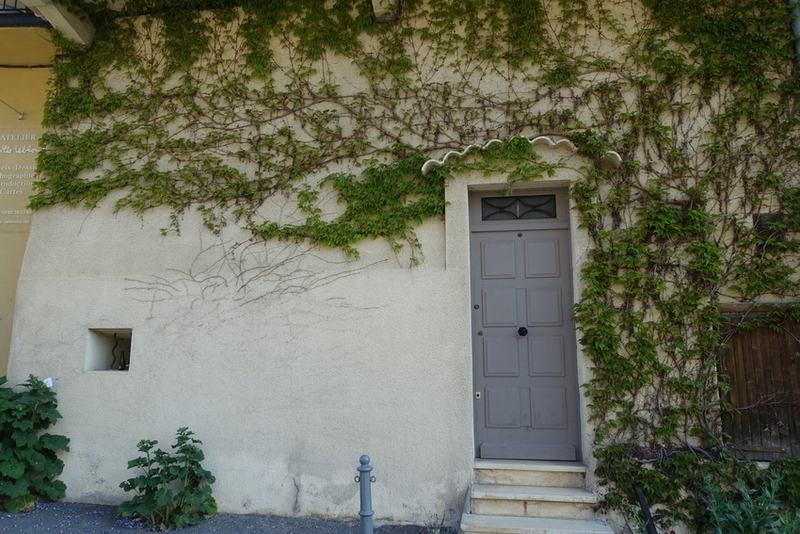 We viewed the arena from the outside, but mostly focused our time on a self-guided Vincent Van Gogh tour - the painter lived and worked in Arles for 14 months. While none of his art is kept in town, you can walk around to nine of the places where he worked on certain pieces, and view copies of those particular paintings in each spot. When I think about Easter 2017, I mostly think about Avignon. We had a fantastic meal at Ginette et Marcel, complete with open face sandwiches and speculoos pie, and spent most of the rest of our afternoon visiting the Palais des Papes, or Pope's Palace. We weren't huge fans of the Pope's Palace, as we left feeling like the exterior is much more grand and impressive than the interior, but we did enjoy the Avignon Cathedral (built before the popes came to town) next door. Very nearby the palace and the cathedral is the Rocher des Doms, a hilltop park with views over the area, including the famous Pont Saint-Bénézet (of which only half remains). After our quick visit to the park, we left Avignon for our final stop of the day, the Pont du Gard. 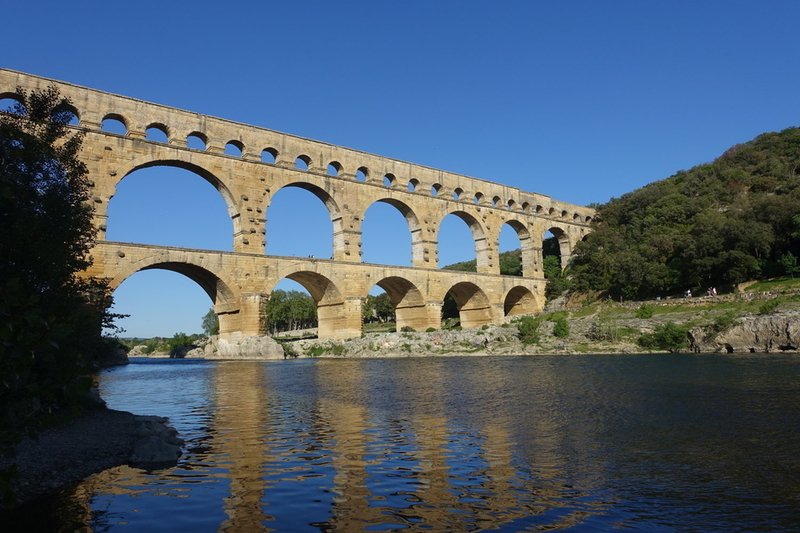 We were eager to have enough time to spend at the Pont du Gard, considered by many to be one of the most impressive Roman aqueducts in the world. Over the years, it has been used not only as an aqueduct, but also a tollgate, a road bridge, and nowadays, a pedestrian walkway. We were able to visit for free due to a spring festival happening and really enjoyed the indoor museum and cinema before heading outside to get our first look at the bridge. We took our time walking around the base, both banks of the river, as well as over the bridge itself before continuing on to our Airbnb and calling it a night. 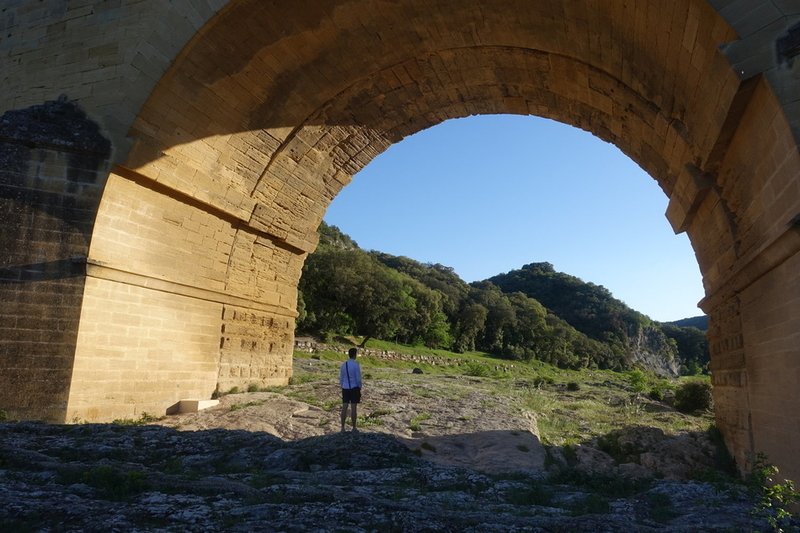 The water flowing under the bridge is very peaceful, and we saw swimmers and canoers/kayakers, both of which would also be fun ways to enjoy the Pont du Gard - the mid-April weather wasn't quite warm enough for us though! D - That evening, at our Airbnb, we enjoyed an impromptu accordion concert from our host, who had performed earlier in the day at the aforementioned Spring Festival - another one of our favorite Airbnb moments. On our final day, we had two primary stops - as well as a bit of driving to do! - before returning the rental car in Toulouse in the evening. We began in Nîmes, one of the most important cities in Roman Gaul. We made quite a few stops in the city, beginning with the Nîmes Cathedral, which sits where a Roman temple to Augustus once did. Earlier in the trip, in Orange, we bought a ticket that allowed us access not only to the Roman Theatre there, but also to many of the sights in Nîmes, like Les Arènes, a Roman amphitheater from 70AD, and La Tour Magne, a tower that stands at the highest point of Nîmes. After doing both, probably only the amphitheater is worth paying for/visiting - but since the tower was already included with our tickets and we had the time, we went for it. In between Les Arènes and La Tour Magne, we visited Maison Carrée, a Roman temple from 2AD, and the inspiration for the Virginia State Capitol. We also walked through the Jardins de la Fontaine on our way to La Tour Magne, which felt more reminiscent of formal palace gardens than a public park, but I suppose that's France for you! Finally, we stopped at the famous walled city of Carcassonne. La Cité de Carcassonne, or the old city, is the second-most visited site in France (followed by the Pont du Gard!) The walls and interior buildings have been heavily restored over the years, making the place feel a little too perfect when you really consider how old and how much history the fortress has seen, but nonetheless, if you're looking for a medieval-looking town, Carcassonne will fit the bill (just try to ignore the herds of tourists and stands selling falafel and ice cream, and be ready to pay through the nose for parking (we felt like many small towns in France were really gouging visitors for parking, but Carcassonne was a whole new level). Inside the walls, there's not much besides shops and restaurants catering to tourists, plus one hotel. The 12th-century Basilica of Saints Nazarius and Celsus still stands, but that too seems to attract primarily tourists. It's just over an hour from Carcassonne to Toulouse, where we wrapped up our final day and flew back home! There's so much to see and do in South of France. We loved every day of the we spent exploring the region - the diversity of sights that are available are vast, from tiny towns to ancient ruins to pretty beaches - there's truly something for everyone. This road trip could be done in any season - November and December would be fun because of Christmas celebrations and markets, traveling later in the spring and into the summer allows for more water activities (keeping in mind that the lavender in Provence is usually at its peak in early July), and fall would be really lovely as well, with good weather, just like when we visited in April. Whenever you visit, you're sure to enjoy this incredible part of the world, the warm hospitality of the French, and the tasty food - we certainly did!